A year in the making, LEFT LANE chronicles life on the road with Alix and her road manager/filmmaker Samantha Farinella as they tour the country connecting the dots from a high school visit in Lincoln, Nebraska to a cd release party in New York City. 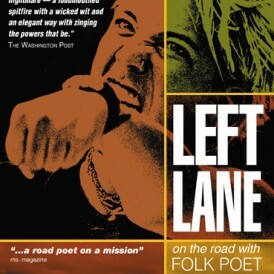 LEFT LANE highlights spoken-word performances from around the country and a plethora of behind the scenes glimpses at the search for independent thought, grassroots defiance, passionate connection, organic food and clean laundry. Accompanied by the music of Pamela Means, Melissa Ferrick, Ember Swift, Lyndell Montgomery, Chris Pureka, and Peter Mulvey, LEFT LANE offers a few more untethered voices to the nucleus of grassroots progressive struggle and the future of laughter, rage, and optimism. “(Left Lane) takes you on the road with fun, funky, and fiery Alix the Great: irresistable force… she may just infect you with optimism… Olson is running at full velocity.